Belia Ortega, Navigant Consulting, Inc. 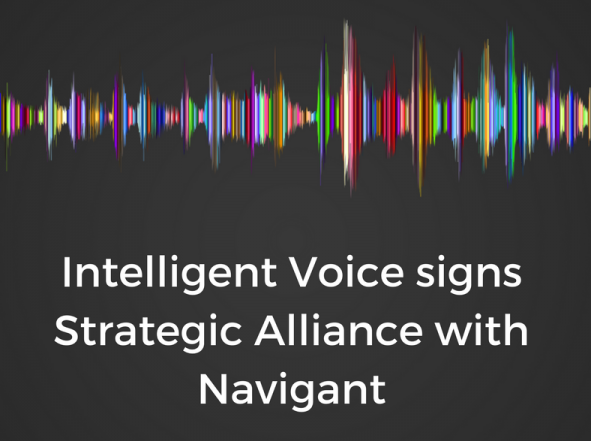 The new strategic alliance will allow rapid and effective deployment of Intelligent Voice for regulatory and investigative matters, in particular a deep integration with leading review tools such as Relativity. Intelligent Voice offers a suite of review capabilities using speech-to-text, phonetic indexing and biometric search. Intelligent Voice offers a suite of review capabilities using speech-to-text, phonetic indexing and biometric search. Intelligent Voice provides cloud-level accuracy from an on-premise solution for clients who do not want data processed using public cloud providers. The solution also ensures compliance with existing and future data privacy regulations including GDPR. Navigant Consulting, Inc. (NYSE: NCI) is a specialized, global professional services firm that helps clients take control of their future. Navigant’s professionals apply deep industry knowledge, substantive technical expertise, and an enterprising approach to help clients build, manage, and/or protect their business interests. With a focus on markets and clients facing transformational change and significant regulatory or legal pressures, the firm serves clients in the healthcare, energy, high tech and financial services industries. Across a range of advisory, consulting, outsourcing, and technology/analytics services, Navigant’s practitioners bring sharp insight that pinpoints opportunities and delivers powerful results. More information about Navigant can be found at www.navigant.com.